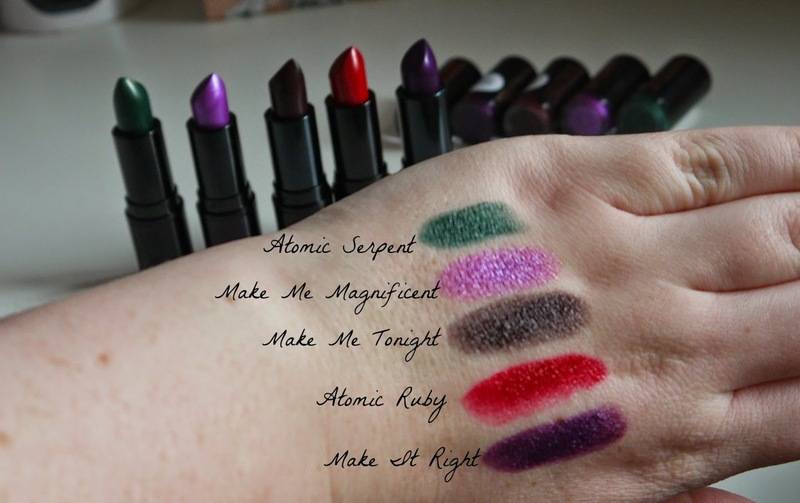 Hello lovelies, today I have for you my favorite purse friendly brand on the blog with there products starting from just ONE POUND that is including these new gorgeous atomic lipsticks! Some are more daring than others but there are two I am in love with already, can you guess which ones they are? Carry on reading to find out and a bit more about them. Make Up Revolution Atomic Serpent £1.00* - Poison Ivy green is the only colour I can describe for this lip shade, I personally wouldn't go to town and get the milk with this on my lips, I probably wouldn't even be brave enough to wear it out in the dark but this would be perfect for a Halloween look! Make Up Revolution Make Me Magnificent £1.00* - This is one of my favorite shades from the atomic lipstick range and probably the most subtle, it is very frozen princessy I think, a beautiful pinky purple with a crystal shine to it. All of the lipsticks glide on the lips so smoothly and don't latch on to any nasty dry bits. Make Up Revolution Make Me Tonight £1.00* - A great autumnal shade, quite a brown shade with a hint of plum purple, this would go on much nicer with a dark lip liner and if you apply a lip liner underneath not only do they make the color pop more they also make the lipstick last that little bit longer. 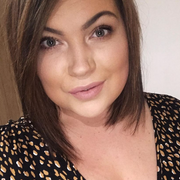 Make Up Revolution Atomic Ruby £1.00* - This is my second favorite lipstick out of the bunch, red lipstick seems to be really growing on me at the moment, I love wearing red lipsticks in winter and this will definitely be worn a lot! Look how stunning it it, bright, very intense, cheery and as red as a post box! You really would turn some heads with this on your lips. 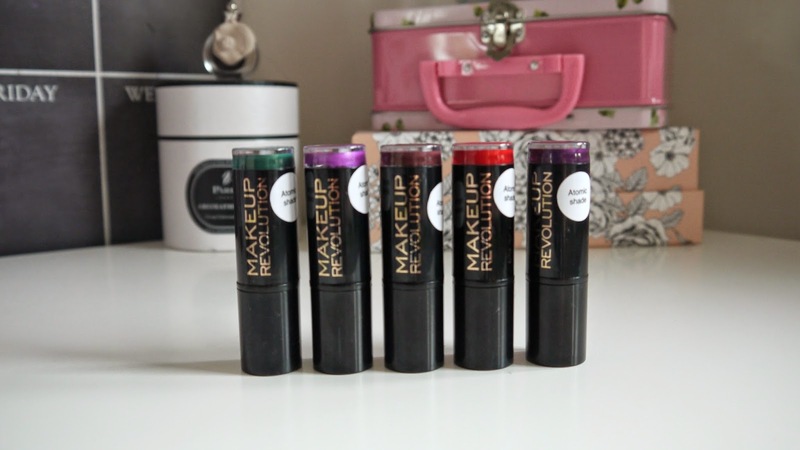 Make Up Revolution Make It Right £1.00* - Another gorgeous autumn lip shade, plummy purple with an almost metalic shine to it. All of these lipsticks have at least a couple of hours wear out of them and they leave the tiniest stain behind which is great if you like longevity from a lipstick. They are super affordable and feel like butter on the lips. Which shades are you liking from my post?